There was a stillness in the air before Kingdom Hearts 3 was announced at E3 2013. It was just moments after longtime director of the series, Tetsuya Nomura, had re-unveiled another project of his, Final Fantasy Versus 13. Versus 13, originally teased in 2006, was now shaped into the mainline title Final Fantasy 15. Immediately after, Nomura announced in the pre-recorded video that it wasn't the only teaser trailer he had that day. Then it happened. Kingdom Hearts 3. The trailer, which showed Sora in the familiar world Twilight Town fighting a giant tower of Heartless, was actually a very early look—even if the moment did end up, at some capacity, in the final game. A year later, Square Enix would announce that Kingdom Hearts 3 was switching engines from the in-house Luminous to Unreal Engine 4. Five years later, co-director Nomura admitted in an interview with the Italian site Multiplayer (translated by Kingdom Hearts Insider) that they had announced Kingdom Hearts 3 too early. 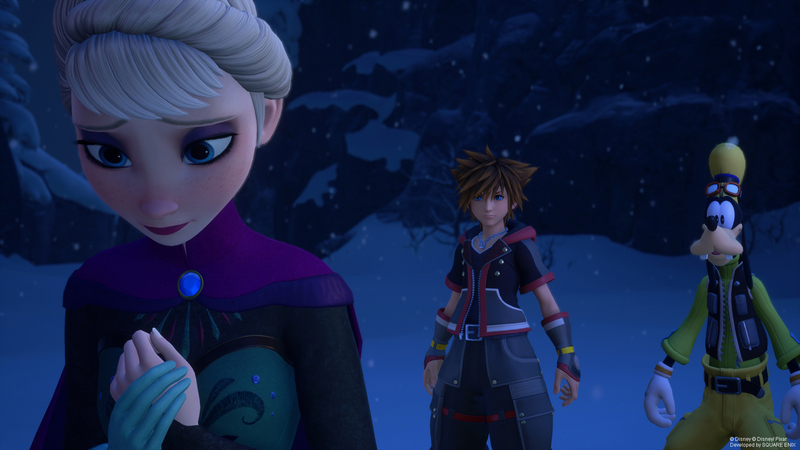 "We were first trying to test the game on Unreal Engine 3," Kingdom Hearts 3 co-director Tai Yasue tells me during this year's Game Developers Conference. "Then we switched to Luminous. Then we shifted to Unreal Engine 4, and that was a corporate decision. So it wasn't really me deciding that I wanted to use Unreal because of this and that; it was a decision from the top." It was a tough switch, Yasue says, because the team working on Kingdom Hearts 3 wasn't used to the new engine and had to learn it from scratch—even the differences between Unreal Engine 3, where Kingdom Hearts 3 was once tested, and Unreal Engine 4 were astounding. Luckily, with Unreal Engine 4 creator Epic Games available for help along the way, the switch eventually worked out very well. "We hit a lot of brick walls, but someone was there to help us out," says Yasue. "So I think that's a major thing, connecting to people. It's not just the technology and the engine." In my review, I remarked that Kingdom Hearts 3 feels, somehow, like a modern PlayStation 2 RPG. Its prolific cutscenes, positive vibe, and floaty combat feel transplanted from another era, but improved and polished for the current generation. Cutscenes transition into gameplay now; plucky hero Sora's ever-spiky hair color has dimensions of brown rather than a opaque chocolate coating. Combat is now visually entrancing, with special moves and keyblades changing Sora's combat style on the fly. On an episode of the podcast Retronauts that I guested on, co-host Jeremy Parish added that its gimmicks, like photographing Mickey emblems hidden across worlds, feel lifted wholesale from PS2 JRPGs like Dark Cloud 2. Some of the gameplay ideas for Kingdom Hearts 3 were even spawned from before production began in earnest. "We did all of these interesting things on Unreal Engine 3 at the very beginning, testing and coming up with concepts, and we actually use a lot of those aspects in the final game," says Yasue. You can even see the Heartless tower that would become an intimidating foe in Kingdom Hearts 3's shipped version in that very first teaser. "For example, you know for the Pirates Of The Caribbean [world], you fly in the air. We had that already in, I don't know if it was 2013, it was really like a while back. So we had a lot of that and experimentation, and we actually tested it inside the company. We had a presentation inside the company and we were looking at everyone's reactions, and everyone was really excited about it. So yeah, we sort of carried that over to the Unreal Engine core." The flying Yasue mentions has been a common trait of Kingdom Hearts games. In the first game from 2002, Sora first learned to double jump. Then he learned to glide. Then he learned to superglide, which basically permits him to fly without consequence. Kingdom Hearts 3 follows a similar trajectory, except his jump already feels higher than usual, and now he can run up walls too without trouble. In one of the biggest changes combat-wise to the series, keyblade Formchanges were introduced. Depending on whatever keyblade Sora has equipped, his outfit and weapon morph into something new for a limited time (like dual, honey-blasting pistols), activated by how much damage he's inflicted. Elements of Formchanges are derived from past games, like Kingdom Hearts 2's Drive Forms, but Formchanges take it a step further. It lets Sora bring the worlds he visits with him, wherever he goes. "We were like children," Yasue says. "This keyblade, this world: what do you want to do most with it? [We] just asked simple questions. And for example, [for the Tangled keyblade,] we wanted a tower at the very end, because it's Tangled, right? We wanted to use all those elements from the world and be able to use it in a battle. We viewed it as a weapon but not, it's also something more. It's sort of iconic and signifies the world, it resembles the world. It takes something from that world and builds on that." Spoiler Warning: The rest of this feature has spoilers for bosses, endings, and more of Kingdom Hearts 3. There's also a mention of a sequence in an ending of Nier: Automata. Proceed with caution! Unlike past Kingdom Hearts games, which have been a mish-mash of classic Disney properties, original worlds, and semi-new Disney adaptations, Kingdom Hearts 3 is almost entirely new-new Disney, with a couple original worlds from past games sprinkled in. You hang out with Boo in Monstropolis. You listen to Elsa sing the entirety of "Let It Go" in Arendelle. You hang out with your favorite deputy in Toy Box, and luckily don't find a snake in your zippered boot. In the early 2000s, the concept of Final Fantasy and Disney colliding was ludacris even then. It worked though, with Sora and comrades Donald and Goofy from Disney travelling to Disney-movie themed worlds to save them from falling to darkness. Seeing Disney worlds in 2019 is even more strange, as Disney has acquired the likes of Marvel, Star Wars, 21st Century Fox, and by the time I'm done writing this article, probably some other major IP-holder too. Yasue speaks highly of the continued partnership with Disney. 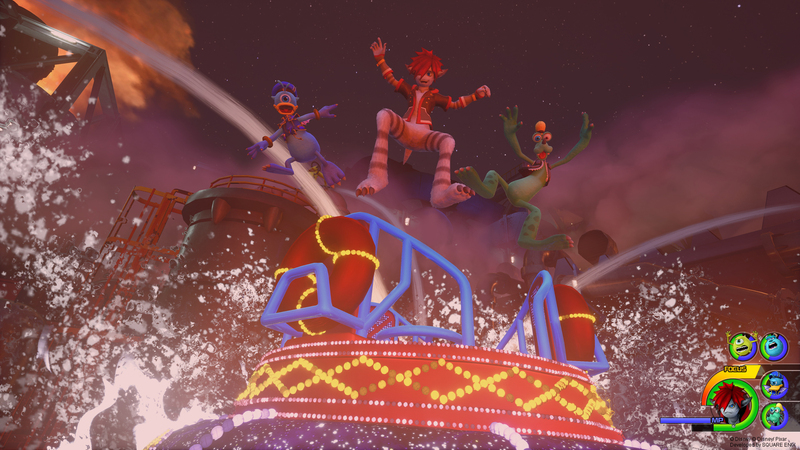 He tells me how the creation of Disney worlds was even a bit looser sometimes for Kingdom Hearts 3, such as in the instances of Monsters Inc. and Toy Story, where Square Enix was able to create its own original stages and have more creative freedom because they didn't follow the movies' plot. "Frozen and worlds such as Tangled, they take place during the movie, so we wanted to respect the storyline of the movie," says Yasue. "We didn't want to change that. So it was sort of like a balancing act, but I think that was also a good decision because people could relive the original film with their gameplay. [...] And for the original ones, you could change things, you can make original things but at the same time it has to feel like Toy Story, it has to feel like Monsters Inc.."
Disney's input also had a helping hand in the concept behind Yasue's personal favorite boss in the game: Sköll, the Heartless Wolf at the end of the Frozen world, Arendelle. The boss is a memorable one: a giant wolf made of mostly ice, who flies around the frozen lake that serves as boss' combat arena while darkness is ominously encroaching. On occasion, the wolf will leap into the cloudy sky, curl up into a giant dark orb, and come crashing down on Sora and company slowly, Majora's Mask style. To stop it, Sora has to team up with Marshmallow—the abominable snowman Elsa makes to protect her ice palace that becomes a friend to Sora on his journey—to push it back and continue dealing damage on the boss in their wolf form. "Originally, we didn't have the wolf," says Yasue. "We had like, what did we have, I think we had a castle or something. Then we discussed this with Disney and the Frozen team. We came to a decision to actually use something more Nordic, so a wolf is more Nordic. So we combined elements of that, and yeah, it came out interesting. It's not just a wolf, it's a flying wolf and it controls the sun." When it comes to other scrapped ideas, Yasue can't quite think of any off the top of his head, aside from small things like a particular particle effect. "Everyone was complaining that I should cut more," says Yasue with a boisterous laugh, "but I didn't. I didn't want anyone to cut. There's a lot of discussion about the seven puddings [challenges] for example, they almost got cut. But I wanted that inside the game. I didn't want that added as a DLC. Everyone made the game as we wanted. So yeah, there wasn't a lot of cutting." One of the biggest omissions was something of an accidental one. For a series that got its start touting itself as a crossover between Disney and Final Fantasy, Kingdom Hearts 3 shockingly lacks any Final Fantasy characters. Gone are brooding Leon (er, Squall); at Olympus, you never ran into the equally moody Cloud (nor Sephiroth) either, where each usually lingers. Where fans were maybe on the edge of their seats hoping for a Lightning or Noctis appearance in Kingdom Hearts 3, nothing came to pass. Even our glimpses at the Final Fantasy characters' home in Radiant Garden, the locale for some cutscenes, didn't feature them. "There wasn't like a decision to omit anything really," says Yasue. "There's so much new stuff, that we're really just concentrating on like Toy Story and Monsters Inc., because we've never done that before. So yeah, I guess a lot of our creative energy went towards creating that and making that well and that good. So it wasn't really a conscious decision to omit Final Fantasy characters. It's more of wanting to do Pixar, Monsters Inc., Tangled, Frozen." On the subject of Final Fantasy characters making their grand return in DLC or a future Kingdom Hearts game, Yasue clams up. "I can't really discuss that right now," he says, "but we respect everyone's opinions obviously. But yeah, I can't say anything right now, no definitive comments on that." There were, however, some surprising collaborations to be found in Kingdom Hearts 3, even if they weren't of our favorite Final Fantasy characters. Over the course of the adventure, it felt like every game from its long, storied history got its moment. Aqua from Birth By Sleep was heroically saved from the Realm of Darkness that she's been trapped in since the events of the PSP game; Xion, long thought to have disappeared when her heart reunited with Sora's in the events of Kingdom Hearts 358/2 Days, makes her grand return. Yet, Kingdom Hearts Union χ [Cross], the mobile and browser game, gets possibly the biggest moment (or moments, counting one of the secret endings) of all. Upon entering the Keyblade Graveyard, Sora, Aqua, a newly awakened Ventus, and many more keyblade wielders find themselves overwhelmed by the amount of Heartless they're facing. Sora bravely charges into a tornado of Heartless, but before he strikes, he has a vision of Ephemera, a major character from Kingdom Hearts Union χ. "Need some help?," he asks. Sora, very confused, then finds himself back on the dirt of the Keyblade Graveyard, wherein he looks up and sees hundreds, maybe thousands, of keyblades left behind from the Keyblade War flying above him. As they swirl around in a snake-like fashion, Sora jumps on them, surfing his way to the tornado of Heartless ahead. "That's a recent development," says Yasue, surprising me a bit. "Because we wanted to collaborate with the UX team, and we were coming up with ideas. They came up, and at the same time we were coming up with ideas for the final battle in the stage. We wanted to do two things: we wanted to connect with the users from Union Cross, UX, and also we wanted to sort of surprise our players and change the game mechanics, the impression of the game design. I think on Kingdom Hearts 3, the situation commands is one of the basic main things that you encounter. So we wanted to do something that exceeded, so we just wanted to line 'em up like that. It's very simple. It's a simple idea, but I think it's very, well there's a lot of impact to that." For what's next after Kingdom Hearts 3 specifically, the secret endings, respectively, nudge the series in new directions. One in resurfacing the Foretellers' conflict and disappearance of the Master of Masters that spurred the Keyblade Wars over 100 years prior to the events of the first Kingdom Hearts; the other, in what sort of non-Disney worlds may end up in Kingdom Hearts next. For Yasue, he has his sights set on the immediate future, with Kingdom Hearts 3's upcoming Critical mode in the works—a new hard difficulty, custom to past games in the series. DLC is also in development for Kingdom Hearts 3, but Yasue is mum on details on that, for now. But if there's one thing we can rely on for the future of Kingdom Hearts, it's Sora and the rest of the game's relentlessly positive outlook. 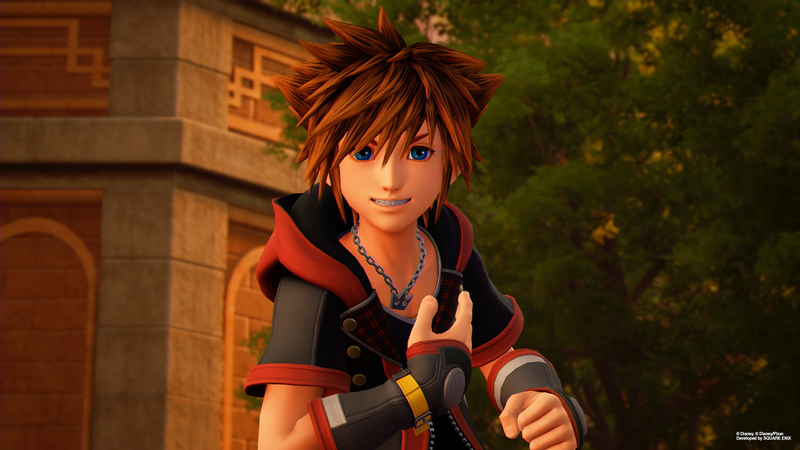 Even in the face of characters wallowing in hell-like darkness for a decade-plus, of heroes being killed or lost, unknown if they will return to the living again; Sora is always upbeat, and looks on the bright side of things. His positivity is what drives the series, and it's why everyone loves him immediately upon meeting him. 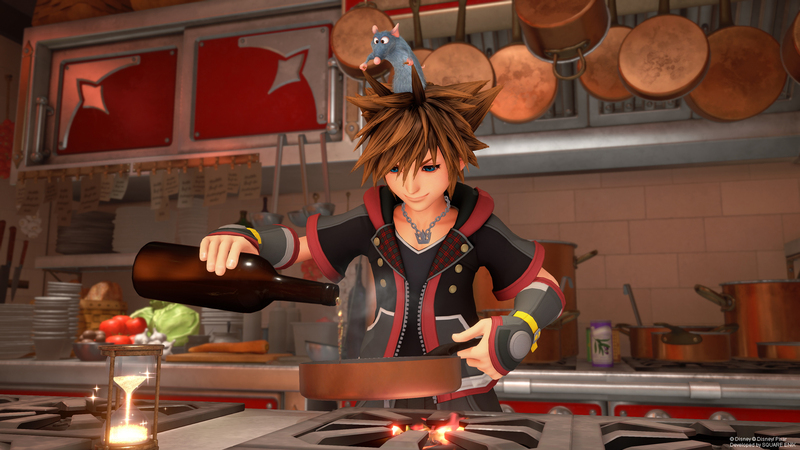 There's arguably no other hero in games as easily lovable as the doofus Sora, especially in an era where triple-A sad dads are on the rise. "I personally really like the happy sort of mood. I think a lot of my coworkers do too. And so we're very happy with that, Sora's positiveness," Yasue tells me. "Another major thing is we're working with Disney obviously, and a lot of their worlds are happy and positive. So I think really, we wanted to take that mood into the game and not make it really dark. There is dark parts to it, but it's very varied, there's a lot of happiness." As Kingdom Hearts 3's chapter is mostly closed now, it's been a rollercoaster of an experience for Yasue, who got his start on the series in co-directing Kingdom Hearts Re: Chain of Memories in 2007. For the first time in a very long time, he can almost relax. "I remember coming to GDC right before I started making Kingdom Hearts games," he says, "and I never came to GDC afterwards because I was so busy. Now I'm here today and it's very different. I think I was just starting off becoming a game designer, and started Kingdom Hearts, and I was so frantic. I wanted to learn everything. And now I've finished the game. I'm here at GDC, meeting people, and I understand more of the technology. It's a very different experience here. So yeah, it's kind of cool." Tagged with Action,	Feature,	GDC 2019,	PlayStation 4,	Role Playing Games,	Rpgs,	Square Enix,	Tai Yasue,	tetsuya nomura,	Xbox One.